Weevil is agroup in beetles, in narrow sense that is the generic name of the beetlesclassified as Curulionidae or Rhynchophoridae, yet is from Curculionoideasuperfamily which Attelabidae and Longhorn beetle seem not closely related toweevil belong. They are highly adapted to be herbivore, some time causeenormous damages to crops. Over 1,000 species described live in Japan, andthere are over 60,000 species in the world, indicates that is a quite big groupin various beetles. The length of theimagoes are some millimeters to a few centimeters, have hard and roundishshell, is the protection covers their slow motions, and many weevils exhibitthanatosis -apparent death-. 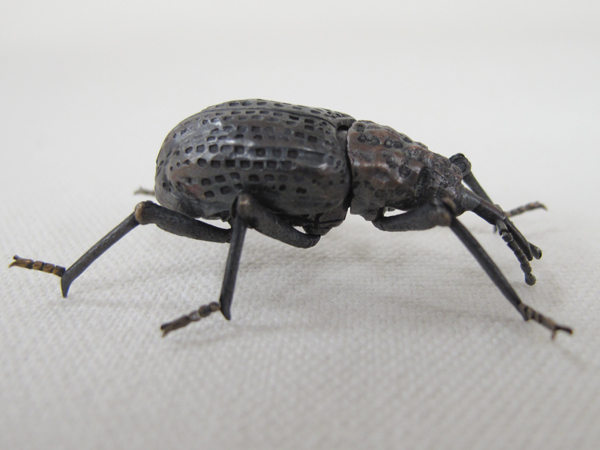 Some species have long proboscis that is theorigin of the Japenese name “Zoumushi – Elephant Bug”. The proboscis is theorgan adapted for perforating vegetable tissue to blow in, yet there are someweevils degenerated that have short proboscises. In autumn, if you pick up chestnuts, you would find the bugs inside ofthem, are the larvae of weevils. The reason why there are bugs in them, eventhough the nuts have no holes on the surface, is said that the nuts weevilsblow in is always young, and the holes are repaired by growth, so the holes yousee are made by the larvae when they come out from the inside. “Sipalinus gigas” is the motif of this work made in 2005, yet modified in2009 to be reborn, is large and has dignity in its figure, as the fact that iscalled the king of weevil.